Ideal bonfire night food - serve it indoors in generous bowls with the vegetables before going out to watch the fireworks. In a large ovenproof casserole dish, heat the olive oil, add the sausages and fry for 4-5 minutes until brown all over. Remove and set to one side. Add the shallots to the pan and cook for 4-5 minutes until golden, then add the lardons and cook for a further 2-3 minutes, stirring continuously. 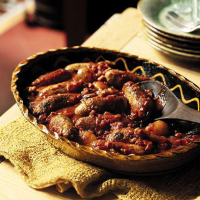 Return the sausages to the pan along with the passata and Napoletana sauce, 250ml cold water, the chestnuts, rosemary and seasoning. Mix well and bring to a simmer, cover and cook for 20 minutes, until the sausages are thoroughly cooked. Serve with a generous helping of sweet potato and parsley mash to mop up all the sauce, and the roasted parsnip and beetroot with sesame seeds. This recipe can be made ahead. Cover and place in a preheated 180°C, gas mark 4 oven for 25 minutes to reheat. To transport the casserole, leave it in the dish, remove the lid and cover in clingfilm. Replace the lid and wrap with clingfilm again - this will ensure no spillage when it is travelling. Grab a couple of wines sealed with screwcaps. The big, warm juicy flavours of an Australian red will be very welcome. Or mix up some spicy mulled wine using ready-made sachets.